Explore the Colosseum and find out how it worked. Watch a video about the Sultan Ahmend Mosque, also known as the Blue Mosque. Help Louis XIV make Versailles the most beautiful palace in the world. Print out and construct models of Sydney Opera House, the Tower of London, Himeji Castle and many other famous buildings. Meet the ravens of the Tower of London today. See how the Empire State Building in New York will be lit tonight. Discover more about the religious complex, the temples of Angkor Wat. Can you guess the height of St Paul’s Cathedral, Big Ben and other buildings in London, UK? 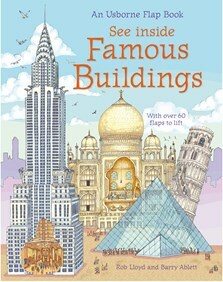 A fabulous flap book with over 50 flaps to lift and extra pages to pull out offering a peek inside some of the world’s most famous buildings. Stunning illustrations show the fronts and insides of royal palaces, soaring skyscrapers, cathedrals, castles and mosques. Perfect for the holiday season. Kids’ book with fun flaps of information on the Colosseum, the Gherkin, and many more buildings in between. A perfect introduction to architecture. Kids enjoy opening the flaps to discover fun facts and detailed artwork, knowledge has never been so much fun!